Today I’m reviewing a small company called HumBird, made by a mom in the Bavarian Alps, she’s been creating cloth diapers for 6 years now. I had the opportunity to try the Wool Diaper Cover which is an AI2 wool wrap. This cover is super soft to the touch and stretchy. It actually fits both my 5 month old and my 2 year old. She states that it should fit 10 to 45 lb. and can be used as a cover or an AI2. This means you can put it over any fitted diaper or a prefold or flat. Or use inserts which is sold seperatly. 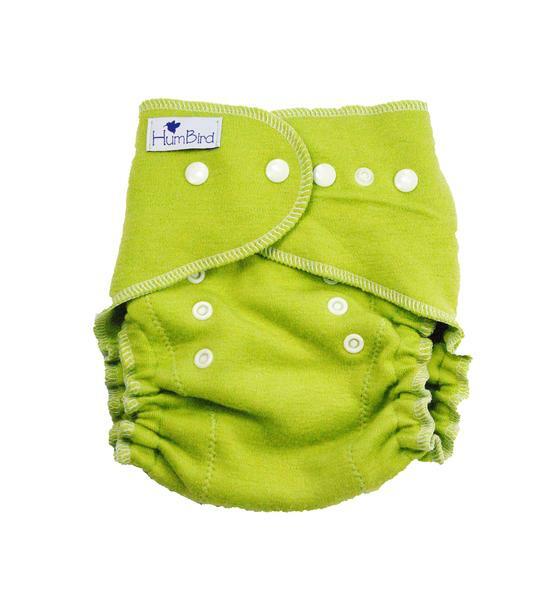 Wool covers are often priced quite high which can change our mind about purchasing them, since we are looking to save money when using cloth diapers. However these wool covers are super affordable, at only 34.99 US dollars. Fun Fact: About wool, is that you can lanolize it and you can reuse a cover many times before you have to wash it. All you have to do is let it air out between uses and its natural antimicrobial properties act as a natural cleanser. This cover has great absorbency for daytime, I found that with the insert it lasted a good 4 hours. As for nighttime I had to use a fitted. The cover itself is rather thin even with one of the inserts, when used with fitted or both inserts its a little bulky but that is expected since fitteds are on the bulky side. Overall: I would recommend Humbird wool wrap, its perfect for daytime and great for kids with allergies. I love how you can wash it in the wash and not only by hand. That looks awesome. He's like a tiny little lumberjack. Very cool. Love anything thats gentle on our littles! Love this review. I wish we have this when my son was little. This is so cute, and I love that it's made by a person and not mass-produced in factories. I'm not a mom yet, so I don't really know... But what is this wrap used for? Is it just to cover the diaper, or does it have a purpose? Oh my, I would have loved to have bought these when I was cloth diapering (30+ years ago). I have a friend who is expecting a new grand child. I'll send her your link. They are going to try cloth diapering as well and I love that these are made by a mom for moms. I wish that I did cloth diapers with my youngest. They are so cute. This is super cute. I wish I had these when my daughter was little but I knew so little about this kind of thing then. Those look great. I wish I would have done cloth diapers with my girls. I know it could have saved us a lot of money too. These would be a great baby shower gift for a friend of mine. She is expecting and was wanting to use these. Oh how I miss all the cute diapers and covers. I loved getting them in the mail. I am more of a PUL cover kinda mom. Though with my last baby all we did was the AIO diapers so I never really needed a cover. I've been loving cloth nappies. I just started creating my own collection for my son. I love all the cool colours. Adorable cloth diapers. So wish they had these when my boys were little. I love how diaper wraps/covers are so stylish now a days! These in particular are adorable and colorful! I wish I have these things when my kids were little. They look more comfotable than the regular diapers. What a cutie. Those look warm and comfortable! Fantastic review! I have never used diaper cloths/covers with my children, but I hope to do so with my next child. What a great review. I am buying a shower gift soon and will be looking at these diapers! Cloth diaper a hot items here in my country too. There are plenty of brands to choose from, it's confusing.